My hero photo at St Andrews in South Georgia. This is the location where we could see the largest king penguin colony in the island and perhaps the whole world. I have just come back from a great adventure sailing from South America to Antarctica, South Georgia, Tristan da Cunha and Cape Town. Spending nearly 2 months at the sea or landing on the most breathtaking locations in the world left me filled with an experience I never thought I can have. I won’t speak too much about the destination, and let the images do the speaking. Instead, I rather tell you a little story about how it happened. Once, as a young boy, I got a present for Christmas. A book. 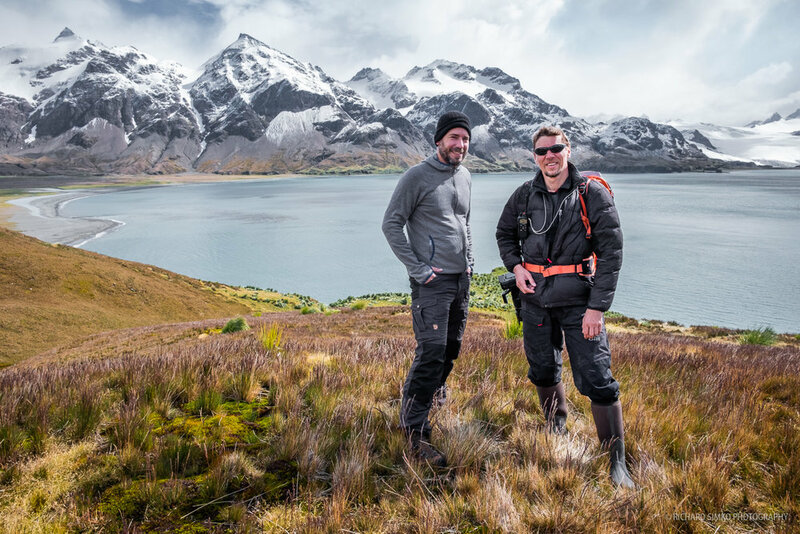 A book about exploration, discovery, and conquest of the remotest places in the world. Be it the highest peaks in the Himalayas, deeps of the worlds oceans or cold and inhospitable corners of Arctic and Antarctica. I was totally hooked and I didn’t put the book down until I finished reading. All I knew, I wanted to go to the same places, see and experience the same things, as these explores did. Being born in Czechoslovakia made the things little more complicated. 18 year of my life I lived behind “Iron Curtain” and traveling outside the “red zone” was very difficult if not impossible at all for the majority of people. After the “Velvet Revolution” in 1989, the doors to the world opened. Finally, there was a real chance to see the world. But it took a few more years before I embarked on these adventures. I finished my university, military service and then I had a “normal” life for a while before I left my country in my early thirties to work overseas. Still a rookie traveler, I slowly started exploring the world. Infected with a traveling bug I realized I am working only to save money for my next trip. That what mattered to me. No buying unnecessary things, no eating in restaurants, no parties, no drinks no unnecessary expenses. I lived a modest life and did whatever it took to save money for my next adventure. I never understood people who had to own things to be happy. For me, experiences matter much more. So I traveled as much as I could and tried to soak in every moment and experience. My new career overseas started in 2004 working in the creative and visual effect industry. It was great and, it gave me the opportunity to work with some very interesting and talented people and on a number of nice film projects. But it was “killing” me at the same time. Long hours in front of the computer, RSI, deteriorating eyesight, weekend work, tight deadlines, and no personal life were taking a toll on me, physically and emotionally. I kept pushing through it. At least this lifestyle gave me a reasonable financial means to travel. But after 10 years I reached the breakpoint and I was longing for change. I thought a major trip would give me a chance to recharge and put me back on track. So I started planning. 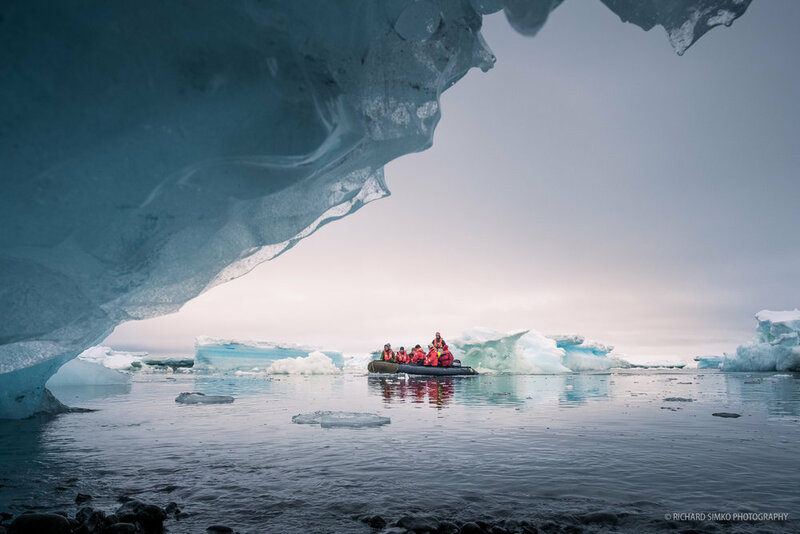 Antarctica was always on my destination list but for the longest time, it was out of reach. Over the years of dreaming, planning, and saving I made the decision to go for it. One day, I stumbled upon Bark Europa’s website. That very moment I knew, I have to sail to Antarctica on this ship, whatever the cost is. Cruise ship just wasn’t an option anymore. They say, in your old days when you reflect back on your life, you’ll regret things that you haven’t done rather the ones you did. 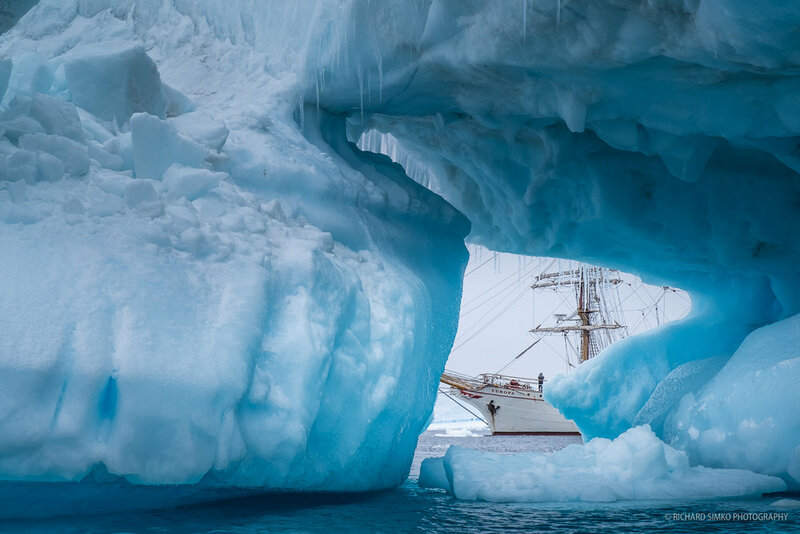 I didn’t want this to be that case so I signed up and sailed to Antarctica in 2018 as a voyage crew (paying passenger). The experience was fantastic. So much so, that I expressed an interest to work on the ship. Sounds crazy. A guy with from a small town with no experience in sailing and guiding from a country that doesn’t even have a sea. It sounds impossible and many said I can forget about it. But I dreamed and hoped. Almost the whole year after my first trip they almost proved me wrong that I actually can make it. Until the first days of January 2019. I have received a message about a vacant guiding position on Europa with an unbelievable question at the end of the message? Would you be interested to join as a guide? “Hell yes”, I almost screamed at the whole train I was traveling on at the time I received the message. Not even one month passed and I was boarding the ship in Ushuaia. This time as a crew member. It is quite a different experience to be a crew member on Europa as opposed to voyage crew. There are 39 passengers on board and 17 crew. Captain Janke, first mate Finn, second mate Merle, bosun Enguerrand, deckhands Lex, Loek, Adam, Rune, Mille, Beth, Gjalt and Merel cooking, Rembert in charge of ship’s bar, Adrian as a doctor and us, 3 guides. Expedition leader Jordi, Sarah and myself. The crew works very very hard. There is little or almost no time to rest. Some of the crew is working on 6 on, 6 off watch. Meaning 6 hours on duty and 6 hours rest. Others including myself work on 12 on 12 of a system or otherwise called “day watch”. When at sea, we do sailing-related work such as pulling ropes, setting or taking away sales, furling, unfurling and such. Apart from that, we work in the galley, do lectures for the voyage crew. During the landing, we do our obvious guiding duties on land. On top of that, we are working on documents, permits, voyage log that will be given to every voyage crew member at the end of the trip. These are just a few of the duties, the list goes on. It is hard, but I enjoy it a lot. This is a much healthier life that I led in the last 10 years for sure. I wonder how could I sit hours in front of a computer, working late and barely get out of the office for the entire day. How can I ever go back to the same job? Even at this moment, I am pinching myself, wondering if this is really happening. I am constantly going back to the image of a young boy reading that captivating book about exploration and dreaming to at least have little taste of what that book was about. And here I am, guiding in Antarctica, South Georgia, and Tristan da Cunha, as crazy as it sounds. The dreams do come true. Some smart people say there are no impossible goals, only never tried ones. And I grabbed this opportunity and didn’t let go. I am not sure what the future holds for me but I am incredibly grateful that I am able to experience things that most of the people can’t. The working relationship with Jordi and Sarah was great. I learned a ton from them. I am not sure if I will be back next season or not. It is a possibility and if the office confirms it, I may be back. This can be it, the change I was longing for. I am still going back to my old job for a while but the temptation to do this massive leap of faith is big. I am home only a few days but I already miss the ship, the awesome crew, the experience, the adventurous stern zodiac landings, the laughter and good times. Even the damp and cold days will stay with me for the rest of my life. As we say on board, it is wet cold and miserable, but we all love what we do. Never stop dreaming, never stop living. One can achieve anything if there is a determination and will to work for it. 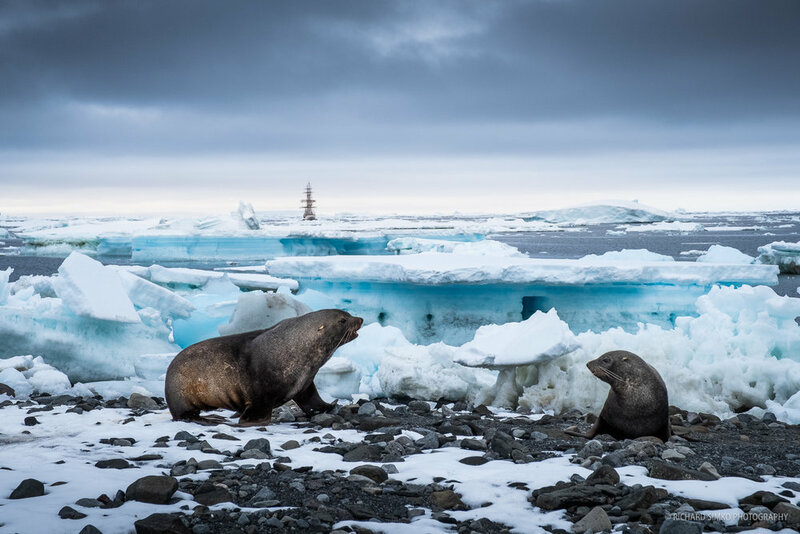 Antarctic fur seals finding a refuge between scattered old whale bones. Whalers Bay, Deception Island. I guess it is no surprise that penguins are curious. This pair is checking out the red life jacket bags we left on landing site. Portrait of a weddel seal. It is snowing, while Europa is drifting between the icebergs waiting for us that are ashore for landing activities. A big yawn from an antarctic fur seal bull. On place like this it is not possible to drop the anchor. Ice is constantly moving and so is the ship. It takes some effort from the crew to manoeuvre safely in the middle of this ice field. Europa on anchor next to Argentinian polar station Esperanza. This is rather a large station and it is the place where the first child was born in Antarctica. Antarctic fur seal is curiously looking at me with Europa drifting between the ice in the background. Quiet, still and moody scene we encountered when we left the Esperanza polar station. Sarah manoeuvring the zodiac in between ice blocks at the Vega Island. There is a huge floating ice field between the landing site and Europa. This was a new previously not visited landing site at Vega Island. The first batch voyage crew arrives to Vega Island landing site finding their way between constantly moving ice. Antarctic fur seal in late afternoon light. This is wilderness with everything that comes with it. Only the strongest prevail. The weak die. There are remains, bones and skulls everywhere. A pair of skuas feed on a dead penguin, fighting to get the best bite. A sight of majestic Europa seen through the hole of and huge iceberg. When skua annoys the seal the chase begins. And it is fun to look at. Fur seal can be surprisingly agile as they have different bone structure in upper body compared to “true seals” such as elephant or weddel seal. Giant petrels feast on the dead body of what seems to be a Southern bottlenose whale stranded ashore. Antarctic fur seal. This time a rare “blonde” version. Rare it may be but we actually encountered a few of them during our trip. Sunset scene from Penguin Island found in South Shetlands archipelago. Resting leopard seal surrounded with purple kelp. A bite from fur seal can be painful and potentially very dangerous. It is best not to take any chances and stay in a safe distance. The late afternoon and low sun create a very dreamy scene with seals playing on a rock close to the beach. A scene from Penguin Island. Antarctic fur seals create a nice silhouette against dropping sun, nicely backlit with warm colours. A bunch of young elephant seals are sunbathing on the beach with one curiously lifting the head to observe the incoming strangers. The Elephant Island, place of a unbelievable survival story where in 1916, the crew of Shackleton’s expedition was stranded until they were rescued four and a half month later. We couldn’t land at this spot. It was windy with gusts reaching 60 knots making it impossible to even get close to the island with the ship, let alone attempt landing by zodiacs. Europa drifting in a safe distance behind the field of big ice blocks. A giant petrel is flying by the ship at Scotia Sea. 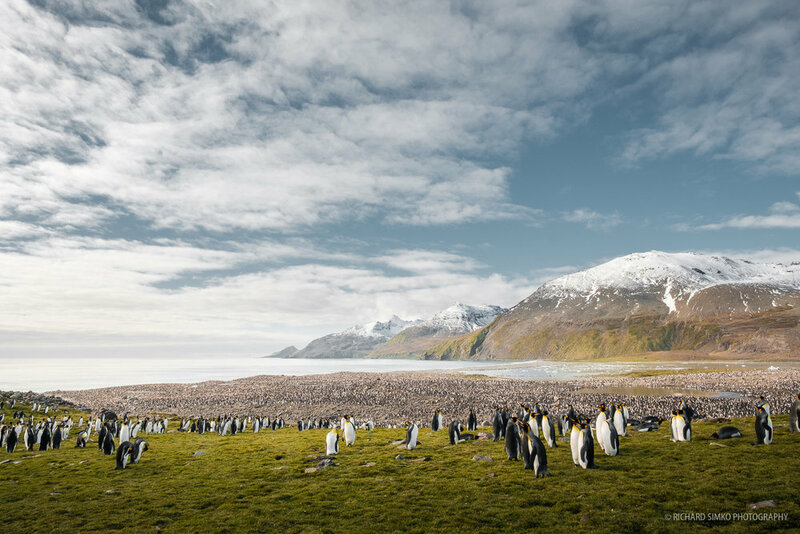 Second largest king penguin colony on South Georgia is located at Salisbury plane. 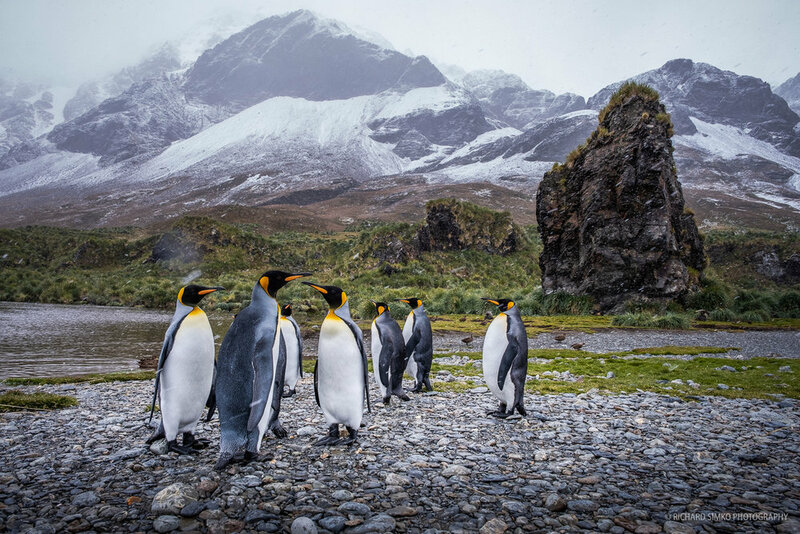 A group of king penguins are returning to the sea and making their way to the main colony. They are curious and not afraid of us at all. As long as we stay still, they walk by very close to us giving an excellent opportunity for close ups even with wider lens. Antarctic fur seal pup is sleeping on patch of tussac grass on Prion Island. South Georgia. King penguin bidding farewell to Europa that is about to lift the anchor after the last of us leave the landing site. Salisbury plane, South Georgia. On the way to work. When visiting any wildlife colony, it is very important that we leave a free access to the see for animals. These penguins are making their way to the sea through such a free space we left for them. King penguin colony at Salisbury Plane in South Georgia is the second largest colony with about 80.000 birds. 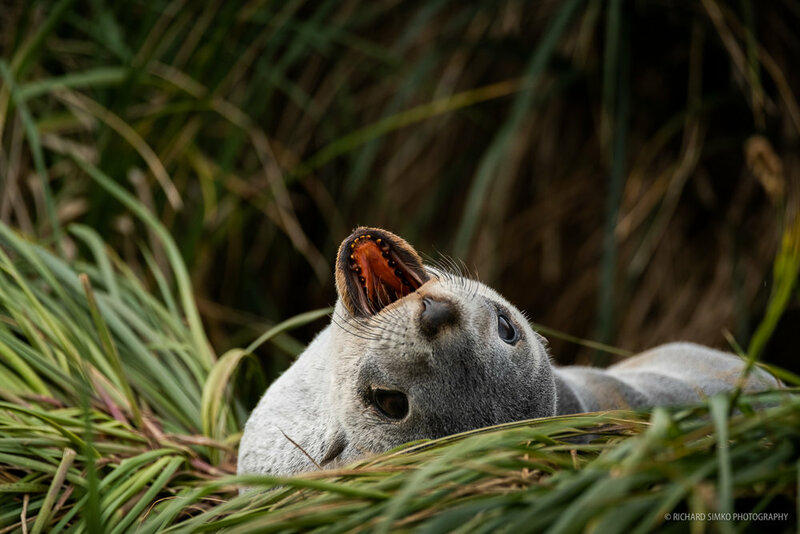 Antarctic fur seal pup in tussac grass on Prion Island. Fur seals were once almost extinct. But they number grew and in such and extent that they are taking over certain places from other wildlife. 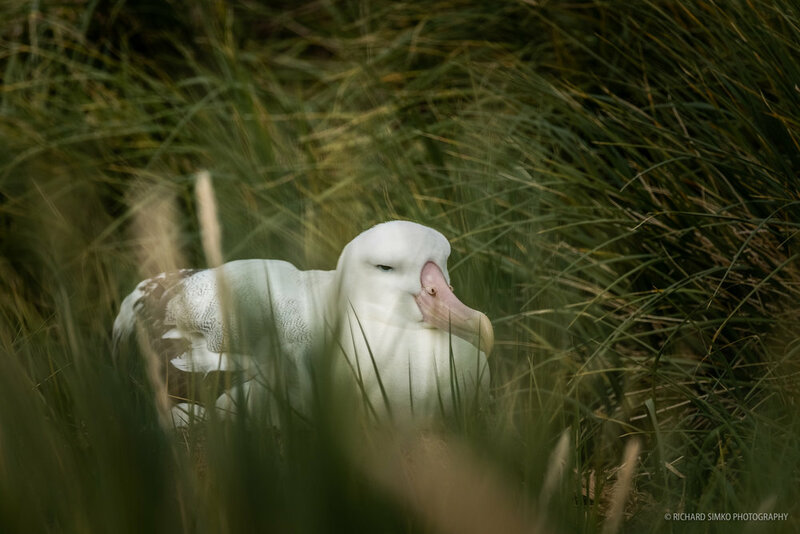 This is a pup at Prion Island resting in tussac grass which is primarily a location for nesting albatrosses. Albatross sitting on the nest in the middle of tussac gras on Prion Island. They spend most of their life flying around and on the sea. Prion Island is one of the most heavily protected locations in South Georgia. And it is the only place we can visit and observe nesting albatrosses. King penguins at Whistle Cove, a location of a smaller king penguin colony. The place is surrounded by huge rugged mountains. King penguin welcome committee at landing site in Whistle Cove. Weather in South Georgia is unpredictable. We landed during misty morning, we had snow as seen on this picture and we ended up with sunny noon. I can stay 5 metres away from wildlife and respect the rules, but how do you explain it to a curious king penguin when they want to come close. A pair of king penguins and fur seal pup on a huge grass field in Whistle Cove. Green moss is nicely contrasting with grey stones and pure clear water stream. Fur seal pups are playing in the grass in front of graves of deceased whalers. A antarctic fur seal pup thought these huge chains can be a good spot for some rest. Grytviken. The remains of the old whaling station are the only one in South Georgia that is possible to visit. The grave of Ernest Shackleton who passed way in South Georgia. He was one of the best known polar explores of all time. We have been very lucky as we came across these very rare blonde fur seals several times during our trip. Small hut in Ocean Harbour and of course antarctic furs seals that we can find almost everywhere. South Georgia is home for many rugged alpine peaks that reach over 3000m. Weather is changing quickly and initial sunny day can turn into a dramatic cloudy one quickly. Europa anchoring in Ocean Harvour with the shipwreck of Bayard creating this nice colourful view. 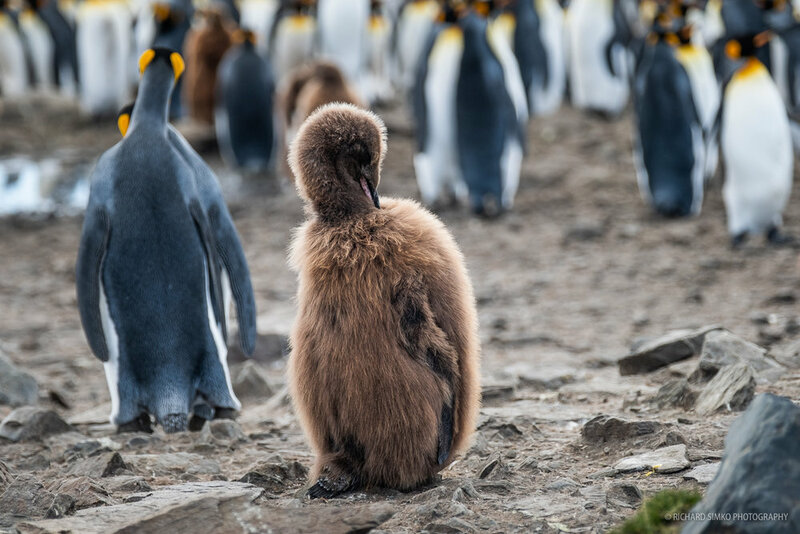 A king penguin chick still with brown feathers that will moult soon and the chick will resemble the natural colors of the species soon. A group of king penguins on a grassy patch not far from the main colony at St Andrews. 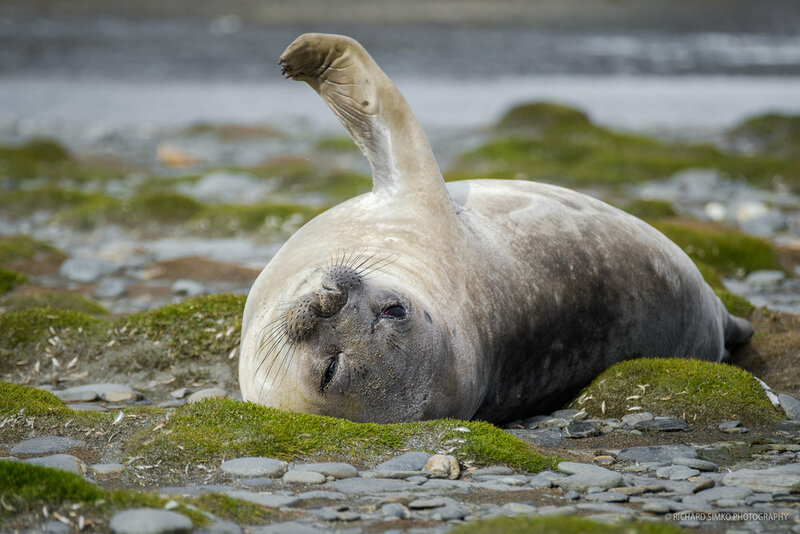 We came across few elephant seal bulls lying on the beach in Moltke Harbour, just being lazy and sunbathing. Young elephant seal bull showing off. The size of the king penguin colony in St. Andrews is staggering. About 200.000 breeding pairs. It is a spectacular view. A different view of the king penguin colony in St. Andrews. If you take the previous photo into account you can appreciate the size of it. There is a nice long but narrow water steam in Moltke Harbour coming down from one of the hills surrounding the place. Luckily the water runs fast so I was able to blur the water even with handheld shot. Antarctic fur seals are playing on green mossy/grassy patch. Photo taken during our last landing in South Georgia, Moltke Harbour.